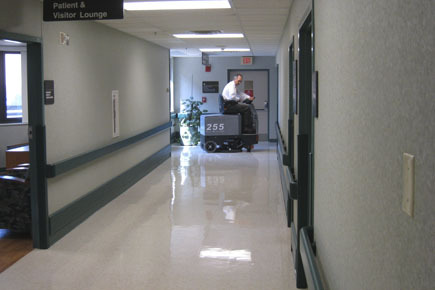 Mirror like reflections can easily be attained by the use of our Stone Floor Polishing Systems and UHS Burnishers. This can save on electricity as well as cleaning and maintence costs. 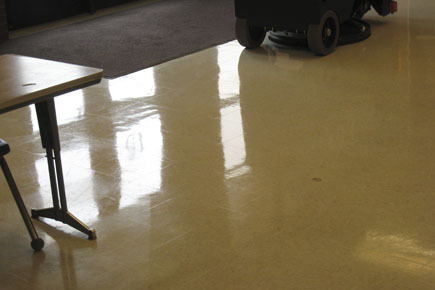 Leave behind a streak of high shine gloss wherever you drive the Model 255 Rider Floor Burnisher. 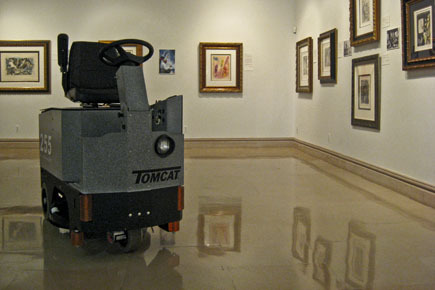 This machine can tackle a variety of floor surfaces, finishes, as well as different finish levels. 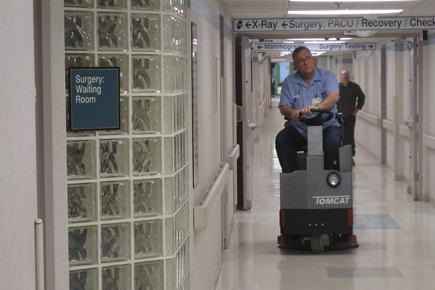 Quiet enough to run in a hospital as well as with our built in Dust Control methods, no need to worry about clearing out people due to high flying dust. 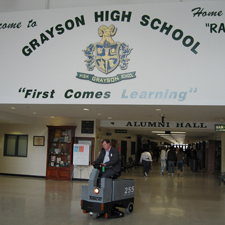 Restore high wear areas in schools, hospitals, and other commercial businesses with an easy to use, Rider machine. 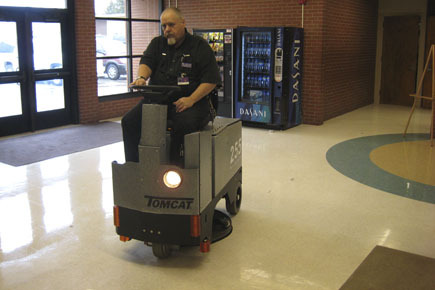 This Rider Burnisher is great where there is lots of floor to buff and need to keep decibels low like: hospitals, schools, and businesses. Dust control is standard on all our burnishers so you don't have to worry about working around others or throwing dust into the air. 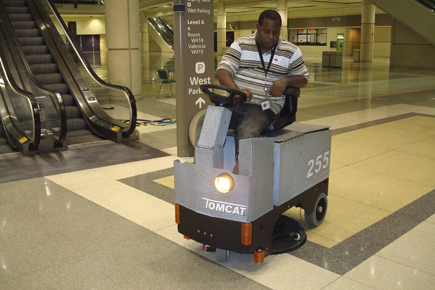 This ride-on unit provides comfort and control in doing a difficult task, in the easiest manner possible. Now you can have a Rider Burnisher that is actually SMALLER than most walk behinds on the market. 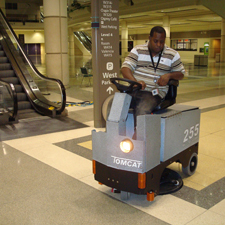 The Tomcat 255 Micro Ride-on has double the battery of the walk behinds and 35% wider burnishing path. 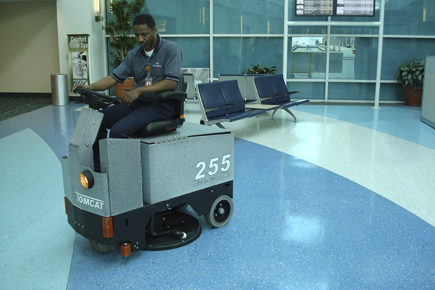 The 255-XL boasts a 27 inch path and can be equipped to run over 4 hours on a single charge, which is enough to polish over 140,000 square feet. 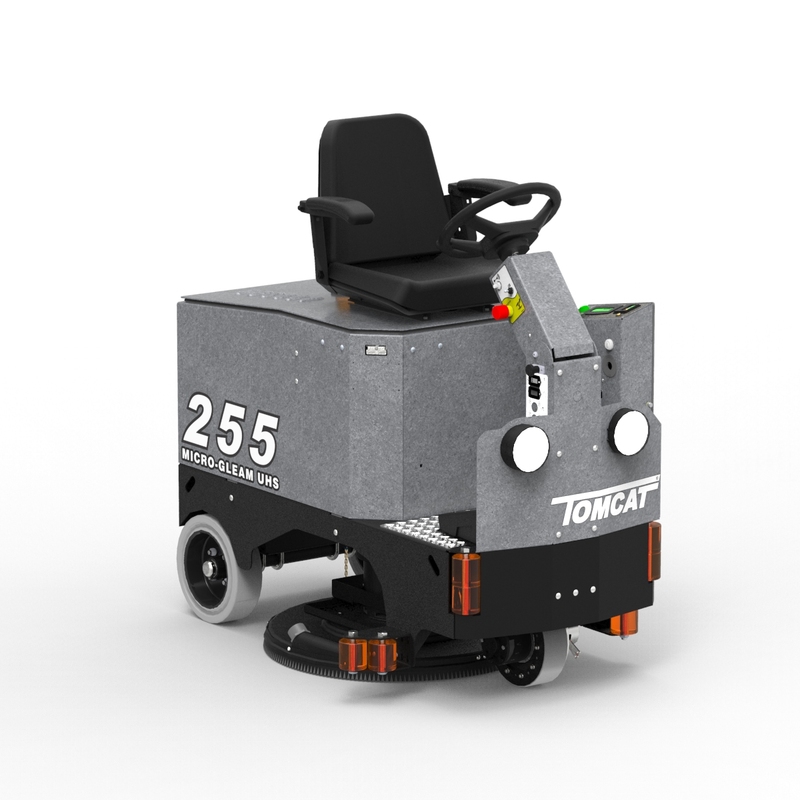 Like all Tomcat Floor Burnishers, the 255 is quiet, fume-free, and can eliminate the problems associated with propane equipment. 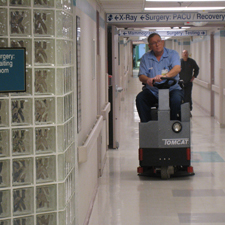 Dust control is standard, along with a comfortable operator's position. The Pad Pressure is variable, and our flexible pad driver combined with the floating head design delivers a superior finish. 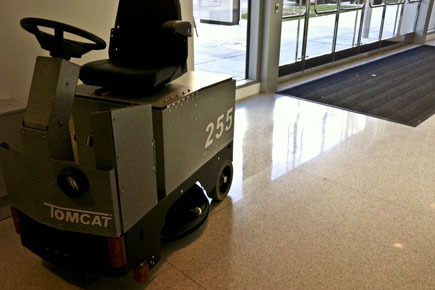 Both ride-on utilize our unique pad drive design which maintains the pad's rpm over uneven floors, and travel speed automatically slows down when polishing. Dimensions (L x W x H): 54.5" x 25" x 50"